Oh heiliger Sankt Florian / Verschon unser Haus, steck’ andere an! May 4th is the commemoration day of the execution of Florian von Lorch. The year: 304. The reason: conflict of religion. Florian von Lorch was an officer in the Roman army and also responsible for organizing fire-fighting troops. He converted to Christianity during a period in history when it was not the accepted fashion. The Romans ordered him to renounce his faith and offer sacrifice to the Roman Gods. He refused. 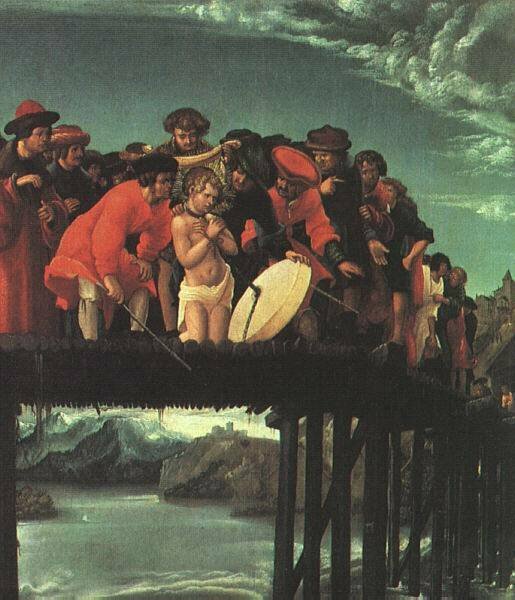 The result: he was tortured, then executed by drowning. They tied a millstone around his neck and threw him into the Enns River in Austria. 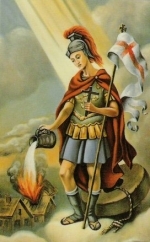 St. Florian is the patron saint of the firefighters, chimney sweeps and beer-brewers, among other professions as well. German fire brigades actually use the name Florian along with their truck identification numbers when radioing communications. And do the Germans need another reason to throw a party? Tonight, if you are anywhere near Baiersdorf in Germany, swing by the Catholic Church, then by the fire house to celebrate St. Florian’s feast day! This entry was posted in History on May 4, 2012 by lauralibricz.